The Property Rights and Artisanal Diamond Development Project II (PRADD II), is a 5-year, $18.9 million project that began in September 2013. 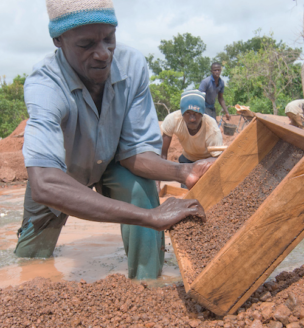 The project builds on the Property Rights and Artisanal Diamond Development project that was piloted in Central African Republic in 2007 and expanded to Liberia in 2010. The project is designed to support the Government of Guinea’s compliance with the Kimberley Process Certification Scheme by strengthening internal control systems, and increasing the volume of rough diamonds that enter the legal supply chain. The project also seeks to improve the governance of surface and sub-surface resources, including the primary property rights of landowners and the secondary land rights of miners in order to reduce conflict, promote economic development, improve livelihoods and strengthen tenure security for vulnerable communities. USAID has designed and is implementing a Difference-in-Difference impact evaluation for USAID’s PRADD II project. The evaluation focuses on project interventions in the Forécariah region in Guinea and will assess the project’s impact on strengthening surface and sub-surface property rights, enhancing livelihood outcomes, reducing land and natural resource conflict and promoting the environmental rehabilitation of artisanal mining sites with a focus on the differential impacts these interventions have on women, resource-constrained and other potentially vulnerable groups, such as youth. Given the multi-pronged project design, the evaluation analyzes a “bundle of interventions” to identify changes in outcomes over a 5-year period in villages and mining sites in the treatment and control sites. Focus group discussions (35), including 11 women-only, 10 youth, 14 general groups of adults. There is little conflict between agricultural land users and miners in the project area.